This article is about the region with various definitions of its extent. For the region that falls entirely within China, see Northeast China. For the region ceded to Russia during the Qing dynasty, see Outer Manchuria. For other uses, see Manchuria (disambiguation). ᡤᠣᠯᠣ, Dergi ilan golo; zh. 東三省 / 东三省, Dōng Sānshěng). 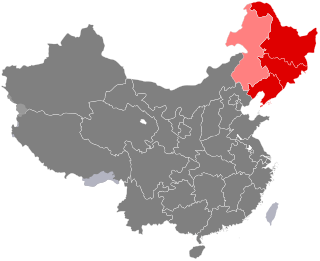 Northeast China (Dōngběi): consisting of Heilongjiang, Jilin, and Liaoning. This is the area referred to as "Manchuria" in the World Geographical Scheme for Recording Plant Distributions. Inner Manchuria: the above, plus parts of modern Inner Mongolia (Hulunbuir, Hinggan, Tongliao, and Chifeng divisions), plus Chengde. The above, plus Outer Manchuria (Outer Northeast China or Russian Manchuria): the area from the Amur and Ussuri rivers to the Stanovoy Mountains and the Sea of Japan. In Russian administrative terms, Ussuri krai, southern Harbin oblast', Primorskiy kray. These were part of the Qing dynasty China according to the Treaty of Nerchinsk (1689) that defined the border in the region between China and Russia, but were ceded to Russia by the unequal treaties of the Treaty of Aigun (1858) and the Treaty of Peking (1860). The above, plus Sakhalin Island, which is generally included on Qing dynasty maps as part of Outer Manchuria even though it is not explicitly mentioned in the Treaty of Nerchinsk. The island was also included in Manchuria on maps made by the Japanese Shogunate and Russian Empire. Despite lines on maps and empires' political claims, the island was inhabited by Ainu people until the Soviet Union enforced an evacuation policy after 1945. "Manchuria" is a translation of the Japanese word Manshū, which dates from the 19th century. The name Manju (Manzhou) was invented and given to the Jurchen people by Hong Taiji in 1635 as a new name for their ethnic group; however, the name "Manchuria" was never used by the Manchus or the Qing dynasty itself to refer to their homeland. According to the Japanese scholar Junko Miyawaki-Okada, the Japanese geographer Takahashi Kageyasu was the first to use the term "満州" (Manshū) as a place name in 1809 in the Nippon Henkai Ryakuzu, and it was from that work that Westerners adopted the name. According to Mark C. Elliott, Katsuragawa Hoshū's 1794 work, the "Hokusa bunryaku", was where "満州" (Manshū) first appeared as a place name was in two maps included in the work, "Ashia zenzu" and "Chikyū hankyū sōzu" which were also created by Katsuragawa. "満州" (Manshū) then began to appear as a place names in more maps created by Japanese like Kondi Jūzō, Takahashi Kageyasu, Baba Sadayoshi and Yamada Ren, and these maps were brought to Europe by the Dutch Philipp von Siebold. According to Nakami Tatsuo, Philip Franz von Siebold was the one who brought the usage of the term Manchuria to Europeans after borrowing it from the Japanese, who were the first to use it in a geographic manner in the eighteenth century although neither the Manchu nor Chinese languages had a term in their own language equivalent to "Manchuria" as a geographic place name. The Manchu and Chinese languages had no such word as "Manchuria" and the word has imperialist connotations. According to Bill Sewell, it was Europeans who first started using the name Manchuria to refer to the location and it is "not a genuine geographic term". The historian Gavan McCormack agreed with Robert H. G. Lee's statement that "The term Manchuria or Man-chou is a modern creation used mainly by westerners and Japanese", with McCormack writing that the term Manchuria is imperialistic in nature and has no "precise meaning" since the Japanese deliberately promoted the use of "Manchuria" as a geographic name to promote its separation from China at the time they were setting up their puppet state of Manchukuo. The Japanese had their own motive for deliberately spreading the usage of the term Manchuria. The historian Norman Smith wrote that "The term 'Manchuria' is controversial". Professor Mariko Asano Tamanoi said that she "should use the term in quotation marks" when referring to Manchuria. In his 2012 dissertation on the Jurchen people to obtain a Doctor of Philosophy degree in History from the University of Washington, Professor Chad D. Garcia noted that usage of the term "Manchuria" is out of favor in "current scholarly practice" and that he had ceased using the term, instead using "the northeast" or referring to specific geographical features. In the 18th-century Europe, the region later known as "Manchuria" was most commonly referred to as "[Chinese] Tartary". However, the term Manchuria (Mantchourie, in French) started appearing by the end of the century; French missionaries used it as early as 1800. 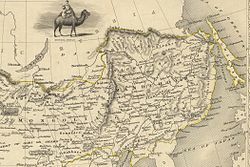 The French-based geographers Conrad Malte-Brun and Edme Mentelle promoted the use of the term Manchuria (Mantchourie, in French), along with "Mongolia", "Kalmykia", etc., as more precise terms than Tartary, in their world geography work published in 1804. In current Chinese parlance, an inhabitant of "the Northeast", or Northeast China, is a "Northeasterner" (东北人; Dōngběi rén). "The Northeast" is a term that expresses the entire region, encompassing its history, culture, traditions, dialects, cuisines and so forth, as well as the "Three East Provinces" or "Three Northeast Provinces". In China, the term Manchuria (traditional Chinese: 滿洲; simplified Chinese: 满洲; pinyin: Mǎnzhōu) is rarely used today, and the term is often negatively associated with the Japanese imperial legacy in the puppet state of Manchukuo (traditional Chinese: 滿洲國; simplified Chinese: 满洲国; pinyin: Mǎnzhōuguó). 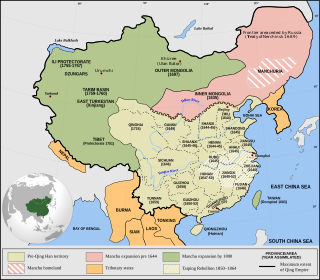 Manchuria has also been referred to as Guandong (traditional Chinese: 關東; simplified Chinese: 关东; pinyin: Guāndōng), which literally means "east of the pass", and similarly Guanwai (關外; 关外; Guānwài; "outside the pass"), a reference to Shanhai Pass in Qinhuangdao in today's Hebei, at the eastern end of the Great Wall of China. This usage is seen in the expression Chuǎng Guāndōng (literally "Rushing into Guandong") referring to the mass migration of Han Chinese to Manchuria in the 19th and 20th centuries. The name Guandong later came to be used more narrowly for the area of the Kwantung Leased Territory on the Liaodong Peninsula. It is not to be confused with the southern province of Guangdong. ᡤᠣᠯᠣ(dergi ilan golo)) since 1683 when Jilin and Heilongjiang were separated even though it was not until 1907 that they were turned into actual provinces. The administrators of the three areas were the General of Heilongjiang (Sahaliyan Ula i Jiyanggiyūn), General of Jilin (Girin i Jiyanggiyūn), and General of Shengjing (Mukden i Jiyanggiyūn). The area of Manchuria was then converted into three provinces by the late Qing government in 1907. Since then, the phrase "Three Northeast Provinces" was officially used by the Qing government in China to refer to this region, and the post of Viceroy of the Three Northeast Provinces (dergi ilan goloi uheri kadalara amban) was established to take charge of these provinces. After the 1911 revolution, which resulted in the collapse of the Manchu-established Qing dynasty, the name of the region where the Manchus originated was known as "the Northeast" in official documents in the newly founded Republic of China, in addition to the "Three Northeast Provinces". During the Ming dynasty the area where the Jurchens lived was referred to as Nurgan. Nurgan was the area of modern Jilin in Manchuria. Manchuria consists mainly of the northern side of the funnel-shaped North China Craton, a large area of tilled and overlaid Precambrian rocks spanning 100 million hectares. The North China Craton was an independent continent before the Triassic period and is known to have been the northernmost piece of land in the world during the Carboniferous. The Khingan Mountains in the west are a Jurassic mountain range formed by the collision of the North China Craton with the Siberian Craton, which marked the final stage of the formation of the supercontinent Pangaea. No part of Manchuria was glaciated during the Quaternary, but the surface geology of most of the lower-lying and more fertile parts of Manchuria consists of very deep layers of loess, which have been formed by wind-borne movement of dust and till particles formed in glaciated parts of the Himalayas, Kunlun Shan and Tien Shan, as well as the Gobi and Taklamakan Deserts. Soils are mostly fertile Mollisols and Fluvents except in the more mountainous parts where they are poorly developed Orthents, as well as in the extreme north where permafrost occurs and Orthels dominate. The climate of Manchuria has extreme seasonal contrasts, ranging from humid, almost tropical heat in the summer to windy, dry, Arctic cold in the winter. This pattern occurs because the position of Manchuria on the boundary between the great Eurasian continental landmass and the huge Pacific Ocean causes complete monsoonal wind reversal. In the summer, when the land heats faster than the ocean, low pressure forms over Asia and warm, moist south to southeasterly winds bring heavy, thundery rain, yielding annual rainfall ranging from 400 mm (16 in. ), or less in the west, to over 1150 mm (45 in.) in the Changbai Mountains. Temperatures in the summer are very warm to hot, with July average maxima ranging from 31 °C (88 °F) in the south to 24 °C (75 °F) in the extreme north. Except in the far north near the Amur River, high humidity causes major discomfort at this time of year. In the winter, however, the vast Siberian High causes very cold, north to northwesterly winds that bring temperatures as low as −5 °C (23 °F) in the extreme south and −30 °C (−22 °F) in the north where the zone of discontinuous permafrost reaches northern Heilongjiang. However, because the winds from Siberia are exceedingly dry, snow falls only on a few days every winter, and it is never heavy. This explains why corresponding latitudes of North America were fully glaciated during glacial periods of the Quaternary while Manchuria, though even colder, always remained too dry to form glaciers – a state of affairs enhanced by stronger westerly winds from the surface of the ice sheet in Europe. Manchuria was the homeland of several ethnic groups, including Koreans, Manchu, Ulchs, Hezhen and possibly Turkic peoples in northwestern Manchuria. Various ethnic groups and their respective kingdoms, including the Sushen, Donghu, Xianbei, Wuhuan, Mohe, Khitan and Jurchens have risen to power in Manchuria. At various times, Han dynasty, Cao Wei dynasty, Western Jin dynasty, Tang dynasty and some other minor kingdoms of China established control in parts of Manchuria and in some cases tributary relations with peoples in the area. Various Koreanic kingdoms such as Gojoseon, Buyeo and Goguryeo were also established in large parts of this area. 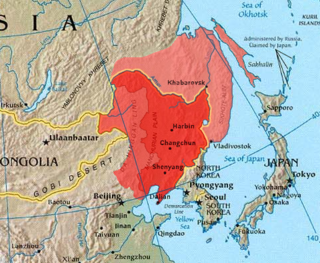 Parts of northwestern Manchuria were under controll of the Turkic Khaganate. A number of world renowned linguists, including Dr. Bang-han Kim, Dr. Alexander Vovin, and Dr. J. Marshall Unger refer to the Goguryeo language and a number of other Koreanic languages like Ye-Maek or Buyeo as distinctly Old Korean. According to several historians, the Korean homeland is located somewhere in Manchuria. With the Song dynasty to the south, the Khitan people of Inner Mongolia created the Liao dynasty in the region, which went on to control adjacent parts of Northern China as well. The Liao dynasty was the first state to control all of Manchuria. In the early 12th century the Tungusic Jurchen people, who were Liao's tributaries, overthrew the Liao and formed the Jin dynasty, which went on to control parts of Northern China and Mongolia after a series of successful military campaigns. During the Yuan dynasty (1271–1368), Manchuria was administered under the Liaoyang province. In 1375, Naghachu, a Mongol official of the Mongolia-based Northern Yuan dynasty in Liaoyang province invaded Liaodong, but later surrendered to the Ming dynasty in 1387. In order to protect the northern border areas, the Ming decided to "pacify" the Jurchens in order to deal with its problems with Yuan remnants along its northern border. The Ming solidified control over Manchuria under the Yongle Emperor (1402–1424), establishing the Nurgan Regional Military Commission. 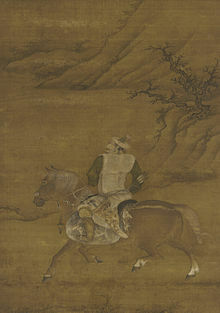 Starting in the 1580s, a Jianzhou Jurchen chieftain, Nurhaci (1558–1626), started to unify Jurchen tribes of the region. Over the next several decades, the Jurchen took control of most of Manchuria. In 1616, Nurhaci founded the Later Jin dynasty, later became known as the Qing dynasty. 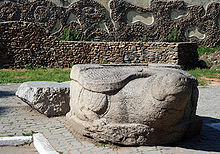 Chinese cultural and religious influence such as Chinese New Year, the "Chinese god", motifs such as the dragon, spirals, and scrolls, agriculture, husbandry, methods of heating, and material goods such as iron cooking pots, silk, and cotton spread among the Amur natives including the Udeghes, Ulchis, and Nanais. 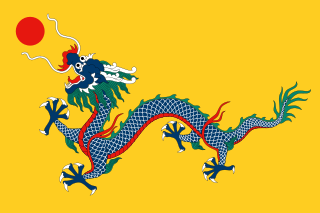 In 1644, after the Ming dynasty's capital of Beijing was sacked by the peasant rebels, the Jurchens (now called Manchus) allied with Ming general Wu Sangui and seized control of Beijing, overthrowing the short-lived Shun dynasty and establishing Qing dynasty rule (1644–1912) over all of China. The Willow Palisade was a system of ditches and embankments built by the Qing dynasty during the later 17th century to restrict the movement of Han civilians into Jilin and Heilongjiang. Only bannermen, including Chinese bannermen, were allowed to settle in Jilin and Heilongjiang. After conquering the Ming, the Qing often identified their state as "China" (中國, Zhongguo; "Middle Kingdom"), and referred to it as "Dulimbai Gurun" ("Middle Kingdom") in Manchu. In the Qing shilu the lands of the Qing state (including Manchuria and present-day Xinjiang, Mongolia, Tibet) are thus identified "the Middle Kingdom" in both the Chinese and Manchu languages in roughly two thirds of the cases, while the term refers to the traditional Chinese provinces populated by the Han in roughly one third of the cases. It was also common to use "China" (Zhongguo, Dulimbai gurun) to refer to the Qing in official documents, international treaties, and foreign affairs. In diplomatic documents, the term "Chinese language" (Dulimbai gurun i bithe) referred to Chinese, Manchu, and Mongol languages, and the term "Chinese people" (中國人 Zhongguo ren; Manchu: Dulimbai gurun i niyalma) referred to all Han, Manchus, and Mongol subjects of the Qing. The lands in Manchuria were explicitly stated by the Qing to belong to "China" (Zhongguo, Dulimbai gurun) in Qing edicts and in the Treaty of Nerchinsk. However Qing rule saw a massively increasing amount of Han Chinese both illegally and legally streaming into Manchuria and settling down to cultivate land as Manchu landlords desired Han Chinese peasants to rent on their land and grow grain, most Han Chinese migrants were not evicted as they went over the Great Wall and Willow Palisade, during the eighteenth century Han Chinese farmed 500,000 hectares of privately owned land in Manchuria and 203,583 hectares of lands which were part of coutrier stations, noble estates, and Banner lands, in garrisons and towns in Manchuria Han Chinese made up 80% of the population. Han Chinese farmers were resettled from north China by the Qing to the area along the Liao River in order to restore the land to cultivation. Wasteland was reclaimed by Han Chinese squatters in addition to other Han who rented land from Manchu landlords. Despite officially prohibiting Han Chinese settlement on Manchu and Mongol lands, by the 18th century the Qing decided to settle Han refugees from northern China who were suffering from famine, floods, and drought into Manchuria and Inner Mongolia, so that Han Chinese farmed 500,000 hectares in Manchuria and tens of thousands of hectares in Inner Mongolia by the 1780s. The Qianlong Emperor allowed Han Chinese peasants suffering from drought to move into Manchuria despite his having issued edicts in favor of banning them from 1740 to 1776. Chinese tenant farmers rented or even claimed title to land from the "imperial estates" and Manchu Bannerlands in the area. Besides moving into the Liao area in southern Manchuria, the path linking Jinzhou, Fengtian, Tieling, Changchun, Hulun, and Ningguta was settled by Han Chinese during the Qianlong Emperor's reign, and Han Chinese were the majority in urban areas of Manchuria by 1800. To increase the Imperial Treasury's revenue, the Qing sold formerly Manchu-only lands along the Sungari to Han Chinese at the beginning of the Daoguang Emperor's reign, and Han Chinese filled up most of Manchuria's towns by the 1840s, according to Abbe Huc. The Russian conquest of Siberia was accompanied by massacres due to indigenous resistance to colonization by the Russian Cossacks, who savagely crushed the natives. At the hands of people like Vasilii Poyarkov in 1645 and Yerofei Khabarov in 1650 some peoples like the Daur were slaughtered by the Russians to the extent that it is now considered to have been genocide. The Daurs initially deserted their villages since they heard about the cruelty of the Russians the first time Khabarov came. The second time he came, the Daurs decided to do battle against the Russians instead but were slaughtered by Russian guns. The indigenous peoples of the Amur region were attacked by Russians who came to be known as "red-beards". The Russian Cossacks were named luocha (羅剎), after Demons found in Buddhist mythology, by the Amur natives because of their cruelty towards the Amur tribes people, who were subjects of the Qing. The Russian proselytization of Eastern Orthodox Christianity to the indigenous peoples along the Amur River was viewed as a threat by the Qing. In 1858, a weakening Qing Empire was forced to cede Manchuria north of the Amur to Russia under the Treaty of Aigun. In 1860, at the Treaty of Peking, the Russians managed to obtain a further large slice of Manchuria, east of the Ussuri River. 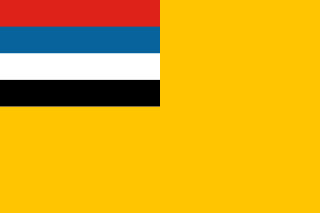 As a result, Manchuria was divided into a Russian half known as "Outer Manchuria", and a remaining Chinese half known as "Inner Manchuria". In modern literature, "Manchuria" usually refers to Inner (Chinese) Manchuria. As a result of the Treaties of Aigun and Peking, China lost access to the Sea of Japan. Inner Manchuria also came under strong Russian influence with the building of the Chinese Eastern Railway through Harbin to Vladivostok. In the Chuang Guandong movement, many Han farmers, mostly from the Shandong peninsula moved there. By 1921, Harbin, northern Manchuria's largest city, had a population of 300,000, including 100,000 Russians. 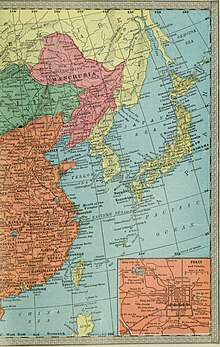 Japan replaced Russian influence in the southern half of Inner Manchuria as a result of the Russo-Japanese War in 1904–1905. Most of the southern branch of the Chinese Eastern Railway was transferred from Russia to Japan, and became the South Manchurian Railway. Japanese influence extended into Outer Manchuria in the wake of the Russian Revolution of 1917, but Outer Manchuria had reverted to Soviet control by 1925. Manchuria was an important region due to its rich natural resources including coal, fertile soil, and various minerals. For pre–World War II Japan, Manchuria was an essential source of raw materials. Without occupying Manchuria, the Japanese probably could not have carried out their plan for conquest over Southeast Asia or taken the risk to attack Pearl Harbor and the British Empire in 1941. It was reported that among Banner people, both Manchu and Chinese (Hanjun) in Aihun, Heilongjiang in the 1920s, would seldom marry with Han civilians, but they (Manchu and Chinese Bannermen) would mostly intermarry with each other. Owen Lattimore reported that during his January 1930 visit to Manchuria, he studied a community in Jilin (Kirin), where both Manchu and Chinese bannermen were settled at a town called Wulakai, and eventually the Chinese Bannermen there could not be differentiated from Manchus since they were effectively Manchufied (assimilated). The Han civilian population was in the process of absorbing and mixing with them when Lattimore wrote his article. Around the time of World War I, Zhang Zuolin established himself as a powerful warlord with influence over most of Manchuria. During his rule, the Manchurian economy grew tremendously, backed by immigration of Chinese from other parts of China. The Japanese assassinated him on 2 June 1928, in what is known as the Huanggutun Incident. Following the Mukden Incident in 1931 and the subsequent Japanese invasion of Manchuria, the Japanese declared Inner Manchuria an "independent state", and appointed the deposed Qing emperor Puyi as puppet emperor of Manchukuo. Under Japanese control Manchuria was one of the most brutally run regions in the world, with a systematic campaign of terror and intimidation against the local Russian and Chinese populations including arrests, organised riots and other forms of subjugation. 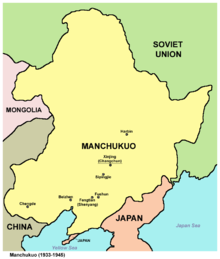 Manchukuo was used by Japan as a base to invade the rest of China. After the atomic bombing of Hiroshima, Japan in 1945, the Soviet Union invaded from Soviet Outer Manchuria as part of its declaration of war against Japan. Soon afterwards, the Communist Party of China and Chinese Nationalist Party (Kuomintang) started fighting for control over Manchuria. The communists won in the Liaoshen Campaign and took complete control over Manchuria. With the encouragement of the Soviet Union, Manchuria was then used as a staging ground during the Chinese Civil War for the Communist Party of China, which emerged victorious in 1949. Ambiguities in the treaties that ceded Outer Manchuria to Russia led to dispute over the political status of several islands. This led to armed conflict in 1969, called the Sino-Soviet border conflict, resulting in an agreement. In 2004, Russia agreed to transfer Yinlong Island and one half of Heixiazi Island to the PRC, ending an enduring border dispute. ^ a b Son, Chang-Hee (2000). Haan (han, Han) of Minjung Theology and Han (han, Han) of Han Philosophy: In the Paradigm of Process Philisophy and Metaphysics of Relatedness. University Press of America. ISBN 9780761818601. ^ a b Xu, Stella (2016-05-12). Reconstructing Ancient Korean History: The Formation of Korean-ness in the Shadow of History. Lexington Books. ISBN 9781498521451. ^ a b Tamang, Jyoti Prakash (2016-08-05). Ethnic Fermented Foods and Alcoholic Beverages of Asia. Springer. ISBN 9788132228004. ^ Giles 1912, p. 8. ^ a b c Clausen 1995, p. 7. ^ Brummitt, R.K. (2001). World Geographical Scheme for Recording Plant Distributions: Edition 2 (PDF). International Working Group on Taxonomic Databases For Plant Sciences (TDWG). p. 12. Retrieved 2006-11-27. ^ Pozzi 2006, p. 159. ^ Pozzi 2006, p. 167. ^ Elliot 2000, p. 626. ^ Elliot 2000, p. 628. ^ ed. Wolff & Steinberg 2007, p. 514. ^ Philippe Forêt (January 2000). Mapping Chengde: The Qing Landscape Enterprise. University of Hawaii Press. pp. 16–. ISBN 978-0-8248-2293-4. ^ ed. Edgington 2003, p. 114. ^ McCormack 1977, p. 4. ^ Pʻan 1938, p. 8. ^ Smith 2012, p. 219. ^ Tamanoi 2000, p. 249. ^ Garcia 2012 Archived 11 September 2014 at the Wayback Machine, p. 15. ^ Tamanoi, Mariko (2009). Memory Maps: The State and Manchuria in Postwar Japan. University of Hawaii Press. p. 10. ^ Nishimura, Hirokazu; Kuroda, Susumu (2009). A Lost Mathematician, Takeo Nakasawa: The Forgotten Father of Matroid Theory. Springer. p. 15. ^ Oriental Affairs: A Monthly Review. 1935. p. 189. ^ Crossley 1999, p. 55. 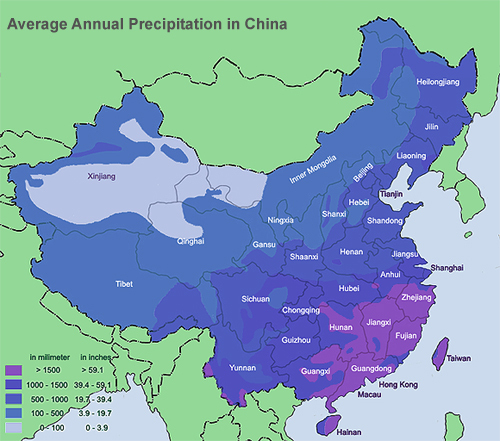 ^ "Average Annual Precipitation in China". Archived from the original on 2 June 2010. Retrieved 18 May 2010. ^ The Cambridge History of China, Vol. 03: "Sui and T'ang China, 589–906, Part 1," at 32, 33. ^ Forsyth 1994, p. 214. ^ Elliott, Mark C. "The Limits of Tartary: Manchuria in Imperial and National Geographies." Journal of Asian Studies 59, no. 3 (2000): 603–46. ^ Hauer 2007, p. 117. ^ Dvořák 1895, p. 80. ^ Wu 1995, p. 102. ^ Zhao 2006, pp. 4, 7, 8, 9, 10, 12, 13, 14. ^ Richards 2003, p. 141. ^ Reardon-Anderson 2000, p. 504. ^ Reardon-Anderson 2000, p. 505. ^ Reardon-Anderson 2000, p. 506. ^ Scharping 1998, p. 18. ^ Reardon-Anderson 2000, p. 507. ^ Reardon-Anderson 2000, p. 508. ^ Reardon-Anderson 2000, p. 509. ^ Bisher 2006, p. 6. ^ "The Amur's siren song". The Economist (From the print edition: Christmas Specials ed.). 17 December 2009. Retrieved 15 August 2014. ^ Forsyth 1994, p. 104. ^ Stephan 1996, p. 64. ^ Kang 2013 Archived 23 May 2014 at the Wayback Machine, p. 1. ^ Kim 2012/2013, p. 169. ^ Rhoads 2011, p. 263. ^ Lattimore 1933, p. 272. Bisher, Jamie (2006). White Terror: Cossack Warlords of the Trans-Siberian. Routledge. ISBN 1135765952. Retrieved 24 April 2014. Bisher, Jamie (2006). White Terror: Cossack Warlords of the Trans-Siberian. Routledge. ISBN 1135765960. Retrieved 24 April 2014. Clausen, Søren (1995). The Making of a Chinese City: History and Historiography in Harbin. Contributor: Stig Thøgersen (illustrated ed.). M.E. Sharpe. ISBN 1563244764. Retrieved 10 March 2014. Crossley, Pamela Kyle (1999). A Translucent Mirror: History and Identity in Qing Imperial Ideology. University of California Press. ISBN 0520928849. Retrieved 10 March 2014. Dvořák, Rudolf (1895). Chinas religionen ... Volume 12; Volume 15 of Darstellungen aus dem Gebiete der nichtchristlichen Religionsgeschichte (illustrated ed.). Aschendorff (Druck und Verlag der Aschendorffschen Buchhandlung). ISBN 0199792054. Retrieved 10 March 2014. Elliott, Mark C. (August 2000). "The Limits of Tartary: Manchuria in Imperial and National Geographies" (PDF). The Journal of Asian Studies. Association for Asian Studies. 59 (No. 3): 603–646. doi:10.2307/2658945. JSTOR 2658945. Archived (PDF) from the original on 17 December 2016. Retrieved 17 December 2016. Elliott, Mark C. "The Limits of Tartary: Manchuria in Imperial and National Geographies." Journal of Asian Studies 59, no. 3 (2000): 603–46. Forsyth, James (1994). A History of the Peoples of Siberia: Russia's North Asian Colony 1581–1990 (illustrated, reprint, revised ed.). Cambridge University Press. ISBN 0521477719. Retrieved 24 April 2014. Garcia, Chad D. (2012). Horsemen from the Edge of Empire: The Rise of the Jurchen Coalition (PDF) (A dissertation submitted in partial fulfillment of the requirements for the degree of Doctor of Philosophy). University of Washington. pp. 1–315. Archived from the original (PDF) on 2014-09-11. Retrieved 6 September 2014. Giles, Herbert A. (1912). China and the Manchus. (Cambridge: at the University Press) (New York: G. P. Putnam's Sons). Retrieved 31 January 2014. Hata, Ikuhiro. "Continental Expansion: 1905–1941". In The Cambridge History of Japan. Vol. 6. Cambridge University Press. 1988. Hauer, Erich (2007). Corff, Oliver, ed. Handwörterbuch der Mandschusprache. Volume 12; Volume 15 of Darstellungen aus dem Gebiete der nichtchristlichen Religionsgeschichte (illustrated ed.). Otto Harrassowitz Verlag. ISBN 3447055286. Retrieved 10 March 2014. KANG, HYEOKHWEON. Shiau, Jeffrey, ed. "Big Heads and Buddhist Demons:The Korean Military Revolution and Northern Expeditions of 1654 and 1658" (PDF). Emory Endeavors in World History (2013 ed.). 4: Transnational Encounters in Asia: 1–22. Archived from the original (PDF) on March 2013. Retrieved 10 March 2014. Kim 金, Loretta E. 由美 (2012–2013). "Saints for Shamans? Culture, Religion and Borderland Politics in Amuria from the Seventeenth to Nineteenth Centuries". Central Asiatic Journal. Harrassowitz Verlag. 56: 169–202. JSTOR 10.13173/centasiaj.56.2013.0169. Kwong, Chi Man. War and Geopolitics in Interwar Manchuria (2017). Lattimore, Owen (Jul–Sep 1933). "Wulakai Tales from Manchuria". The Journal of American Folklore. American Folklore Society. 46 (No. 181): 272–286. doi:10.2307/535718. JSTOR 535718. McCormack, Gavan (1977). Chang Tso-lin in Northeast China, 1911–1928: China, Japan, and the Manchurian Idea (illustrated ed.). Stanford University Press. ISBN 0804709459. Retrieved 10 March 2014. Masafumi, Asada. "The China-Russia-Japan Military Balance in Manchuria, 1906–1918." Modern Asian Studies 44.6 (2010): 1283-1311. Pʻan, Chao-ying (1938). American Diplomacy Concerning Manchuria. The Catholic University of America. Retrieved 10 March 2014. Pozzi, Alessandra; Janhunen, Juha Antero; Weiers, Michael, eds. (2006). Tumen Jalafun Jecen Akū Manchu Studies in Honour of Giovanni Stary. Volume 20 of Tunguso Sibirica. Contributor: Giovanni Stary. Otto Harrassowitz Verlag. ISBN 344705378X. Retrieved 1 April 2013. Reardon-Anderson, James (October 2000). "Land Use and Society in Manchuria and Inner Mongolia during the Qing Dynasty". Environmental History. Forest History Society and American Society for Environmental History. 5 (No. 4): 503–530. JSTOR 3985584. Rhoads, Edward J. M. (2011). Manchus and Han: Ethnic Relations and Political Power in Late Qing and Early Republican China, 1861–1928. University of Washington Press. ISBN 0295804122. Retrieved 10 March 2014. Scharping, Thomas (1998). "Minorities, Majorities and National Expansion: The History and Politics of Population Development in Manchuria 1610–1993" (PDF). Cologne China Studies Online – Working Papers on Chinese Politics, Economy and Society (Kölner China-Studien Online – Arbeitspapiere zu Politik, Wirtschaft und Gesellschaft Chinas). Modern China Studies, Chair for Politics, Economy and Society of Modern China, at the University of Cologne (1). Retrieved 14 August 2014. Sewell, Bill (2003). Edgington, David W., ed. Japan at the Millennium: Joining Past and Future (illustrated ed.). UBC Press. ISBN 0774808993. Retrieved 10 March 2014. Smith, Norman (2012). Intoxicating Manchuria: Alcohol, Opium, and Culture in China's Northeast. Contemporary Chinese Studies Series (illustrated ed.). UBC Press. ISBN 077482431X. Retrieved 10 March 2014. Stephan, John J. (1996). The Russian Far East: A History (illustrated, reprint ed.). Stanford University Press. ISBN 0804727015. Retrieved 24 April 2014. Tamanoi, Mariko Asano (May 2000). "Knowledge, Power, and Racial Classification: The "Japanese" in "Manchuria"". The Journal of Asian Studies. Association for Asian Studies. 59 (No. 2): 248–276. doi:10.2307/2658656. JSTOR 2658656. Tao, Jing-shen, The Jurchen in Twelfth-Century China. University of Washington Press, 1976, ISBN 0-295-95514-7. Wu, Shuhui (1995). Die Eroberung von Qinghai unter Berücksichtigung von Tibet und Khams 1717 – 1727: anhand der Throneingaben des Grossfeldherrn Nian Gengyao. Volume 2 of Tunguso Sibirica (reprint ed.). Otto Harrassowitz Verlag. ISBN 3447037563. Retrieved 10 March 2014. Wolff, David; Steinberg, John W., eds. (2007). The Russo-Japanese War in Global Perspective: World War Zero, Volume 2. Volume 2 of The Russo-Japanese War in Global Perspective (illustrated ed.). BRILL. ISBN 9004154167. Retrieved 1 April 2013. Zhao, Gang (January 2006). "Reinventing China Imperial Qing Ideology and the Rise of Modern Chinese National Identity in the Early Twentieth Century" (PDF). 32 (1). Sage Publications. doi:10.1177/0097700405282349. JSTOR 20062627. Archived from the original on 25 March 2014. The Qing dynasty, officially the Great Qing, was the last imperial dynasty of China. It was established in 1636, and ruled China proper from 1644 to 1912. It was preceded by the Ming dynasty and succeeded by the Republic of China. The Qing multi-cultural empire lasted for almost three centuries and formed the territorial base for modern China. It was the fifth largest empire in world history. The dynasty was founded by the Manchu Aisin Gioro clan in Manchuria. In the late sixteenth century, Nurhaci, originally a Ming Jianzhou Guard vassal, began organizing "Banners", military-social units that included Manchu, Han, and Mongol elements. Nurhaci formed the Manchu clans into a unified entity. By 1636, his son Hong Taiji began driving Ming forces out of the Liaodong Peninsula and declared a new dynasty, the Qing. China proper, Inner China or the Eighteen Provinces was a term used by Western writers on the Manchu Qing dynasty to express a distinction between the core and frontier regions of China. There is no fixed extent for China proper, as many administrative, cultural, and linguistic shifts have occurred in Chinese history. One definition refers to the original area of Chinese civilization, the Central Plain ; another to the "Eighteen Provinces" system of the Qing dynasty. There is no direct translation for "China proper" in the Chinese language due to differences in terminology used by the Qing to refer to the regions and the expression is controversial among scholars, particularly in China, due to national territorial claims. The Amur River or Heilong Jiang is the world's tenth longest river, forming the border between the Russian Far East and Northeastern China. The largest fish species in the Amur is the kaluga, attaining a length as great as 5.6 metres (18 ft). The river basin is home to a variety of large predatory fish such as northern snakehead, Amur pike, taimen, Amur catfish, predatory carp and yellowcheek, as well as the northernmost populations of the Amur softshell turtle and Indian lotus. Manchuria is a region in East Asia. Depending on the definition of its extent, Manchuria can either refer to a region falling entirely within China, or a larger region today divided between Northeast China and the Russian Far East. To differentiate between the two parts following the latter definition, the Russian part is also known as Outer Manchuria, while the Chinese part is known as Inner Manchuria. The Treaty of Aigun was an 1858 treaty between the Russian Empire, and the empire of the Qing Dynasty, the Manchu rulers of China, that established much of the modern border between the Russian Far East and Manchuria, which is now known as Northeast China. It reversed the Treaty of Nerchinsk (1689) by transferring the land between the Stanovoy Range and the Amur River from China to the Russian Empire. Russia received over 600,000 square kilometres (231,660 sq mi) from China. The Treaty of Nerchinsk of 1689 was the first treaty between Russia and China. The Russians gave up the area north of the Amur River as far as the Stanovoy Range and kept the area between the Argun River and Lake Baikal. This border along the Argun River and Stanovoy Range lasted until the Amur Annexation in 1860. For background see History of Sino-Russian relations. Outer Manchuria is an unofficial term for a territory in Northeast Asia that was formerly controlled by the Qing dynasty and now belongs to Russia. It is considered part of Manchuria by some definitions. Russia officially received this territory by way of the Treaty of Aigun in 1858 and the Treaty of Peking in 1860. The northern part of the area was also in dispute between 1643 and 1689. Northeast China or Dongbei is a geographical region of China. It also historically corresponds with the term Inner Manchuria in the English language. It consists specifically of the three provinces of Liaoning, Jilin, and Heilongjiang, collectively referred as the Three Northeastern Provinces (东北三省), but broadly also encompasses the eastern part of Inner Mongolia. The region is separated from Far Eastern Russia to the north largely by the Amur, Argun, and Ussuri rivers, from North Korea to the south by the Yalu River and Tumen River, and from the Inner Mongolian Autonomous Region to the west by the Greater Khingan Range. The heartland of the region is the Northeast China Plain. Willow Palisade was a system of ditches and embankments planted with willows intended to restrict movement into Manchuria, built by the Qing dynasty during the later 17th century. It is often conveniently divided into three connected sections: the western and eastern sections, forming the Inner Willow Palisade around Liaodong Peninsula, and the northern section, also known as the Outer Willow Palisade, separating the traditionally Manchu areas from the traditionally Mongol area north of the Inner Palisade. Ning'an is a city located approximately 20 km (12 mi) southwest of Mudanjiang, in the southeast of Heilongjiang province, China, bordering Jilin province to the south. It is located on the Mudanjiang River, which flows north, eventually falling into the Sungari River near Sanxing. A conquest dynasty in the history of imperial China refers to a dynasty established by non-Han peoples that ruled parts or all of the China proper, most notably the Mongol-founded Yuan dynasty and the Manchu-founded Qing dynasty. Zhonghua minzu, translated as "Chinese nation" or "Chinese ethnicities", is a key political term that is entwined with modern Chinese history of nation-building and race. Manchurian nationalism refers to the ethnic nationalism of the Manchu people or the territorial nationalism of the inhabitants of Manchuria, regardless of ethnic origin. The Qing dynasty in Inner Asia was the expansion of the Qing dynasty's realm in Inner Asia in the 17th and the 18th century AD, including both Inner and Outer Mongolia, Manchuria, Tibet, Qinghai and Xinjiang. Wars were fought primarily against the Northern Yuan dynasty and the Dzungar Khanate (1687–1758). Even before the conquest of China proper, the Manchus had controlled Manchuria and Inner Mongolia, with the latter being previously controlled by the Mongols under Ligdan Khan. After suppressing the Revolt of the Three Feudatories and the conquest of Taiwan as well as ending the Sino-Russian border conflicts in the 1680s, the Dzungar–Qing War broken out. This eventually led to Qing conquests of Outer Mongolia, Tibet, Qinghai and Xinjiang. All of them became part of the Qing Empire and were garrisoned by Qing forces, but they were governed through several different types of administrative structure and also retained many of their existing institutions. Furthermore, they were not governed as regular provinces, but instead were supervised by the Lifan Yuan, a Qing government agency that oversaw the empire's frontier regions. Manchuria under Qing rule was the rule of the Qing dynasty over Manchuria, including today's Northeast China and Outer Manchuria. The Qing dynasty itself was established by the Manchus, a Tungusic people coming from Manchuria, who later conquered the Ming dynasty and became the ruler of China. Thus, Manchuria enjoyed a somewhat special status during the Qing and was not governed as regular provinces until the late Qing dynasty.